← Bolivian true option to stop the egocentric to-be-dictator! With this moving speech, Wálter Gutiérrez Calle from Andapata, a community in the Bolivian department of Oruro, wants to draw attention to the problems his people are beginning to suffer due to copper mining. He has been invited by various environmental organizations to a symposium in Cochabamba on human rights, multinational companies and the Chinese hegemony, to talk about the expansion of Chinese mining in Latin America. 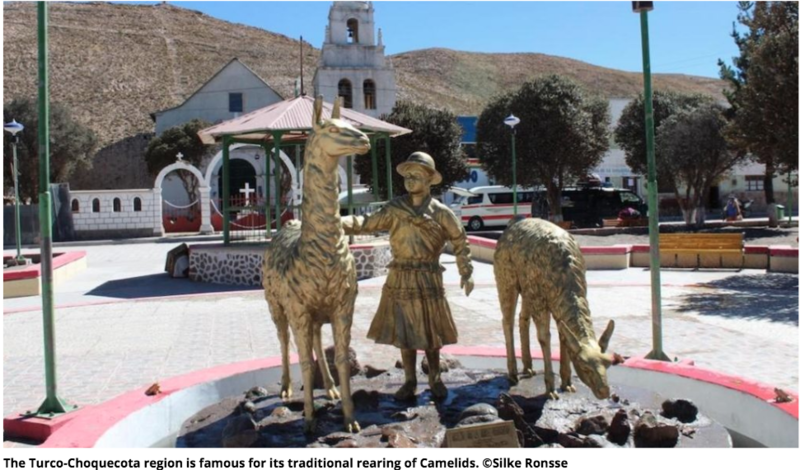 Choquecota municipality, where Wálter is from, is an isolated area in the west of Bolivia, not far from the border with Chile. The inhabitants of Choquecota are natives of Suyu J’acha Carangas. This ethnic group is engaged in small-scale farming and livestock rearing. 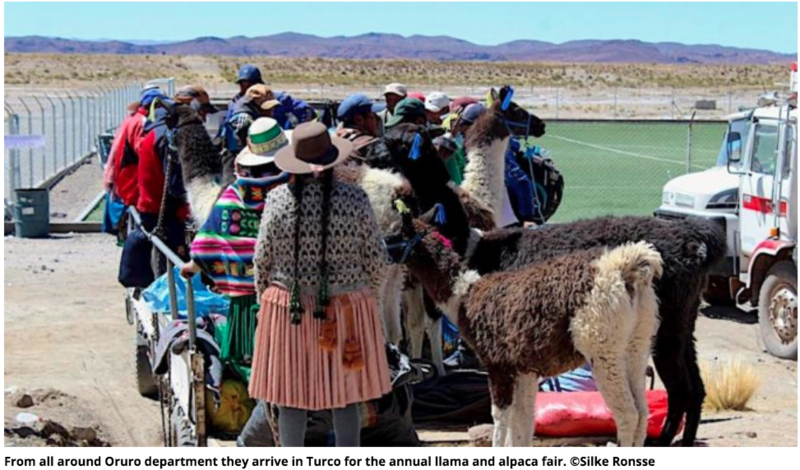 Llamas provide the largest source of income for communities living in the inhospitable altiplano. A few years ago the power of Chinese capital permeated the region and threatened the traditional way of life. The mining company D-Copper S.A started its copper mining operations 5 years ago. Now it wants to open a second mine on the border of the Turco and Choquecota districts. It is a Bolivian company, though 70% of the investments come from Chinese donors. The region is already accustomed to small-scale mining, but has never seen industrial mining on the scale carried out by D-Cobre S.A. The first project, Cuprita, covers about 500 hectares. The creation of the second mine adds another 900 hectares, near the commune of Andapata, where Walter lives. Until recently, the villagers were not even aware of the mining activities of D-Copper S.A in their region. Many of them first learned of the large-scale mining six months ago. This was when the consultation process with the local population was initiated. According to the law, the company needs to pass this consultation process before being able to open a new mine. It is an isolated region and there are no independent organizations that observe the social and environmental impact of mining projects. Consequently, companies in Choquecota can continue their activities without bother. 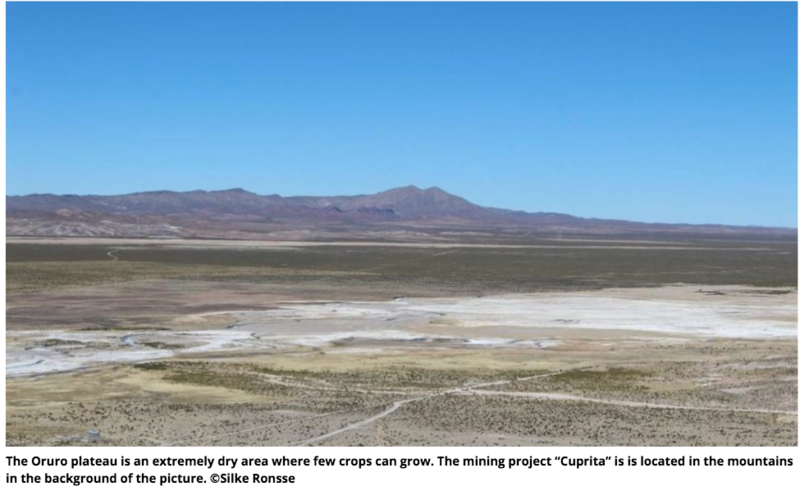 The preliminary consultation on the expansion of the project with Cuprita Two, a second open pit copper mine, was organized in Andapata, where Victoria is from. She explained that the company takes advantage of the communities’ lack of knowledge about the consequences of mining. Open-pit metal mining by definition has a negative impact on the natural environment because the surface is removed using explosives, resulting in a deep pit. In addition, sulfuric acid or hydrochloric acid is used in the copper recovery process. These are chemical and poisonous substances that bind the metal particles as a magnet. Often the contaminated water is not stored properly to reduce costs. If cracks arise in the dam, the acids and heavy metals reach high concentrations in the groundwater. This is life-threatening to humans, animals and the natural environment. Biodiversity in the area decreases, agriculture becomes impossible and there are major health risks to local communities. In his speech, Walter also spoke about the drying up of water resources. As a result of global warming, glaciers in the Andes are melting rapidly. During the dry season, Bolivians in the Altiplano are highly dependent on the meltwater from these glaciers. At the end of last year, which was the driest in Bolivia in the last 25 years, thousands of residents of La Paz protested against the water shortage. Of the little water that is left, much is used in the mining industry. Every day 10,000 cubic meters of water is used in mining. That is twice the amount of water used every day by the inhabitants of La Paz. The great Lago Popoó, located to the south of Oruro, near Choquecota, has already dried up completely. This is due to climate change, but also to the mining industry in the area, where a lot of water is used. There is little talk in Bolivia about mining as one of the main causes of water scarcity, and it has not been recognized as a cause of water conflict by the Bolivian administration, which collaborates with mining companies. Victoria, together with activists of the WasiPacha collective, organized a workshop in Andapata to inform the local community about the consequences of copper mining and the rights of Indigenous communities. They hoped that this workshop would strengthen the position of the villagers during the consultation process. The workshop appeared to achieve results. During the last consultation meeting, the community definitively rejected the project. “We reject the implementation of mining projects due to the ecological, social, cultural and religious damage that it can cause,” the community stated in a resolution. Despite the fact that several communities voted against the project during the consultation, it became clear at the beginning of October that the expansion of the copper mine was being approved by the Ministry of Mining. Under the mining law of 2014, the outcome of mandatory consultations does not determine the final decision. The consultation process just becomes simply a formality that the mining companies have to comply with to inform the communities. One can question what the point of a consultation is if the outcome is not binding. The Ministry of Mining always has the last word and will protect the interests of the mining industry in almost all cases. The Bolivian government has strong links with the extractive industry, since the Bolivian development model is based on this. The environmental problems encountered by the Suyu J’acha Carangas communities in the face of Chinese mining and the violation of their rights by companies are not unique. In recent years, Latin America has become an increasingly important destination for Chinese investors. China’s expansion in the continent is spreading more and more rapidly, focused particularly on sectors that have a negative impact on the environment: oil, mining and agro-industry. In Peru, Chinese companies control more than 40 percent of mining projects. In Ecuador, Chinese companies are active in oil exploitation in the Amazon. Such projects cause social and ecological damage and create many conflicts. One of the conclusions of the Cochabamba Symposium was that the Bolivian government is making it increasingly attractive for Chinese companies to extract raw materials in the country and that they increasingly dominate the mining sector. In the West however, we have a responsibility for the abuses surrounding copper mining. Copper is a relatively inexpensive raw material used for electrifying cars, telecommunications networks and computers. It is the main mineral extracted by Chinese companies in Latin America, primarily for the Chinese production of electronics, of which the EU is a major purchaser. This article was reprinted from Catapa with permission. It infuriates me watching this egomaniac cursing the “empire” and embracing a far worse “empire” … the Chinese do not respect their working force and much less their environment, so … how could they behave in other countries like Bolivia? … they come and go as they please, they have no respect to our native workers, newspapers are filled with news about that “relationship”. Chinese care very little about the ruling concept of “internalizing the externalities” so they can be more “competitive”?! It is because of a mad-man that these Chinese ventures are coming in greater numbers to Bolivia, to make things worse billions have been “given” to Bolivia as loans, first $7 billion dollars, another $10 billion dollars on their way … and to do what exactly? … to build questionable and inefficient infrastructure and to “use” these damn companies that pollute and disrespect our people! This entry was posted in Bolivia, Business, Economics, Environment, Mining, Politics, Social Unrest and tagged environmental damage, government failures, pollution. Bookmark the permalink.